I suppose I should have posted the last two Star Wars plates before I took an abrupt sabbatical, but better late than never right? I drafted these posts back in April and then went into a tailspin of life changes. The good news is things are finally gradually settling. Not settled, mind you, so my attention is still a little bit in limbo, but I wanted to at least finish these last of the Star Wars Original Trilogy plates and make the vague promise that I am looking to work on the Force Awakens stuff once I can get organized to do so. 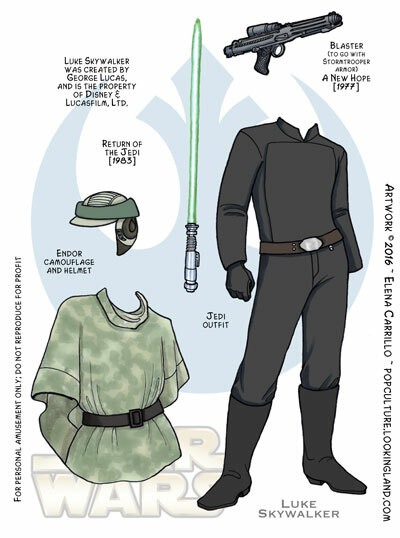 So here’s the last of Luke: his final black Jedi outfit from Return of the Jedi. Luke was probably the first hero I ever knew who decked himself like this (and it must have made an impression since I’ve worn black a lot since). I always thought it made a stark contrast to his previous outfits and solidified his maturing into the Jedi role (it’s very “priestly” in a way). Also included on this plate is Luke’s camo from Endor, his final green lightsaber (after losing the blue one in The Empire Strikes Back–though we all know it’s turned up again since then), and a blaster to go with his stormtrooper outfit because I didn’t have room on the original plate. Apologies again for the loss of continuity between these plates. I have no good excuse since they were complete when I bailed in April and I had plenty of time this summer to post. I was just massively distracted, I guess. I have a lot of work to do drawing the Force Awakens plates, so it could be a while depending on my new schedule. And I honestly don’t know how many characters I’ll do. No matter how much I wanted to include Darth Vader in the mix, there’s just no dignified way of putting Darth Vader in his underwear, so that’s still a project for another time. I already have Rey and Kylo Ren drawn, and promised a Hux for a friend. I will likely make heads and costumes for the OT heroes since they already have bodies I can work with. Otherwise, not sure who else I’ll draw. I’d like to do Finn and Poe, but there are other things I want to work on. We’ll see how it all plays out. Will post the last Leia plate shortly, so look for that! You can subscribe to this blog or follow me on Twitter @BootsNBats to get updates. To see all Star Wars related posts and plates, click the tag or the category at right. Click the Luke Skywalker tag to see all of Luke’s plates (this is the last). It’s our final week of Force February (though the plates will continue in into March in some fashion), and we’ve run out of Han Solo, so this week you’ll get a double-dose of Luke Skywalker. In The Empire Strikes Back, Luke goes through his “grey” phase. Visually the idea was to show Luke’s Dark side inclination by having him dress from light to dark (by Return of the Jedi he’s in full black). 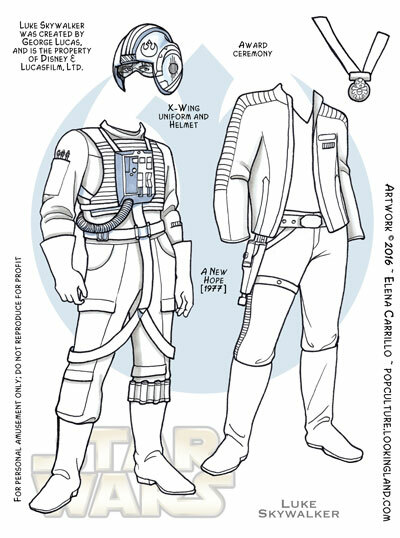 More on that later, but for the moment, here are his two main costumes from the second film and you can see how the Hoth clothes begin the transition from the white/sand colors of Tatooine into a decidedly more grey area. 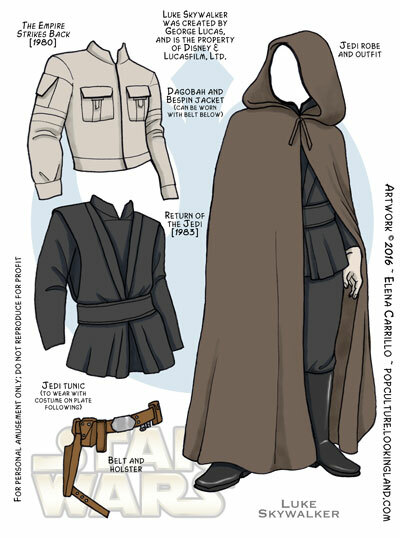 The second outfit is Luke’s training clothes from Dagobah, over which he wears a matching jacket later on Bespin (which is on the next plate–unfortunately it was too much to squeeze in with these two other outfits, otherwise we would have had a nice clean break between films). The clothes that Luke and Leia wore in the medbay at the end of The Empire Strikes Back are two costumes I just skipped over because Leia’s basically looks like her first dress and Luke’s is just a hospital robe. Maybe grey is about as boring as white, but I tried to keep the colors relatively warm (I always thought the Dagobah/Bespin suit was more taupe than grey anyway, but there’s me and my inability to see color again ~ ha!). As previously mentioned, we’ll get a double dose of Luke this week. As far as completed plates, I still have one more of Luke after tomorrow and one more for Leia. We’ll see where we go from there. I might pick up with The Force Awakens stuff, but to be honest, beyond finally managing to draw Adam Driver’s face, I haven’t done any of the costumes for those characters! Also thinking about how I made this blog to talk about other pop culture stuff and haven’t really been doing that in favor of making paper dolls. Which is great, it’s just not the entire reason I started this blog. I don’t know. We’ll see what surfaces in the next few weeks. Well lookie, some actual bona fide color for a change here for Force February! We’ve finally gotten just about all the whites behind us now, so things should liven up a bit. 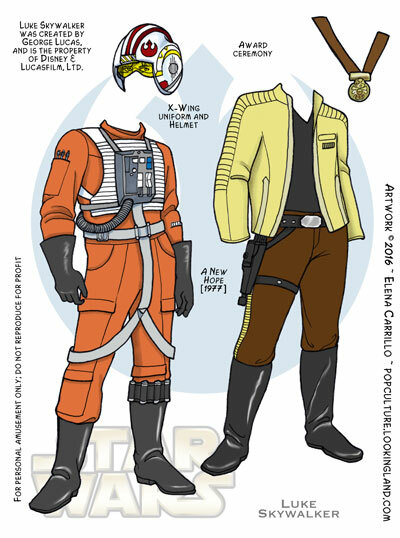 Leave it to Luke to bring us some bright orange and yellow. These are the last plates for Luke from A New Hope. He wears the X-wing suit at the end of the movie and then a similar one in The Empire Strikes Back while doing his snow speeder run on Hoth (the snow version is very similar, but padded, so I skipped it). To be honest, I was dreading drawing the X-wing outfit as it seemed to have a lot of fussy details, but it was actually a lot of fun (straight lines notwithstanding). And then I especially dreaded (and then subsequently enjoyed) making the helmet, which also has some cool details. I’ve always liked the yellow visors on these helmets. I guess I should have made a training helmet with the blast shield down, but there you have it: me and accessories are rather hit or miss. 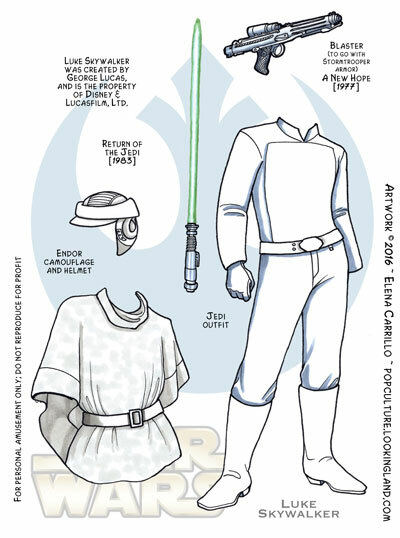 The costume Luke wears on Yavin for the final awards ceremony in A New Hope is interesting in that we never see him in anything like it ever again ~ ha! I still have three more plates for Luke to cover the subsequent films (and still potentially one more to add for The Force Awakens). This is also the moment where I realize that I have all the plates for this week done, but haven’t even begun to color the plates for next week (oops!). I got lazy (lulled into a false confidence with my buffer, as always!). I admit that’s frighteningly true of all my buffers at the moment: the coffers are dangerously low. I’ve got Judy stuff drawn, but not scanned or plated, and I’ll run out of Monday Mayhem plates next week. Guess I need to get on that. In the meantime, enjoy Luke and the ongoing Star Wars plates. Even if I haven’t colored them all yet, at least they are otherwise finished. Er, at least for these characters they are. Since I started last week with Luke Skywalker, we’ll just continue to go in order throughout the rest of the month. 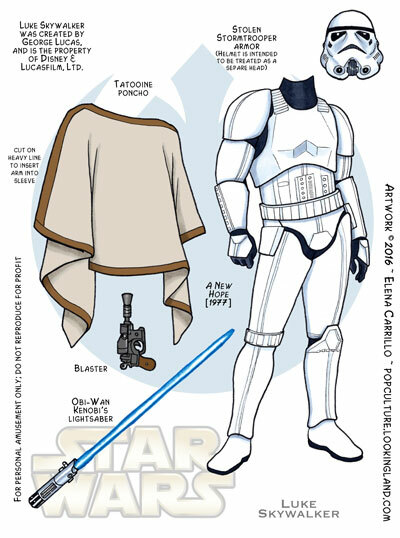 We have today Luke’s poncho, blaster, and his father’s lightsaber (gifted to him by Obi-Wan Kenobi). It’s the same lightsaber we see play a big role in The Force Awakens, which is interesting since it’s been lost since Luke got separated from his right hand in The Empire Strikes Back. We don’t know yet where it’s been since then, but it’s already become quite the Arthurian talisman since. It will be interesting to see where the lightsaber goes from here. It’s fun to watch a prop through its long history. And I really enjoyed making Luke’s lightsabers. 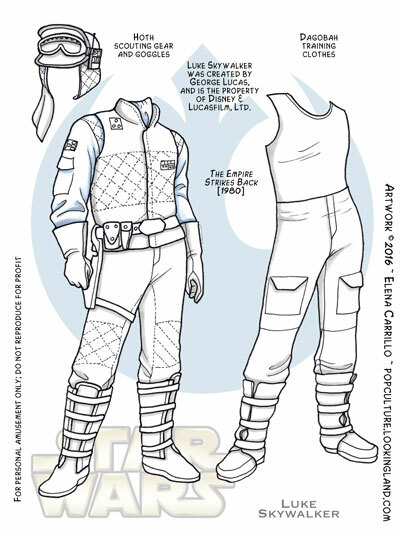 We also have Luke’s stolen stormtrooper outfit. Leia asks him “Aren’t you a little short for a stormtrooper?” when she sees him in this getup (and just a side bit of trivia, it’s when he reveals himself to her that we actually hear his whole name for the first time). 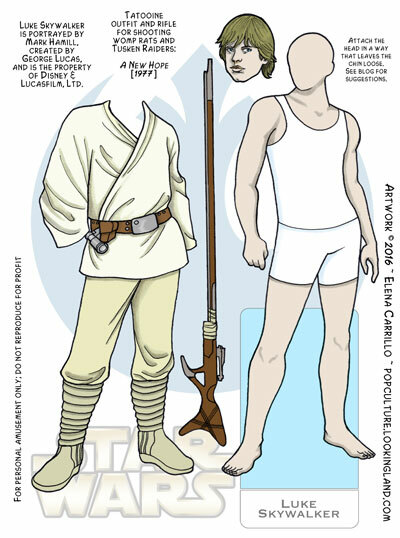 I should note that when I drew these paper dolls, I accidentally scaled Luke to be too tall and had to modify him in PhotoShop. He’s still too tall (Mark Hamill is 5’9″ to Harrison Ford’s 6’1″). 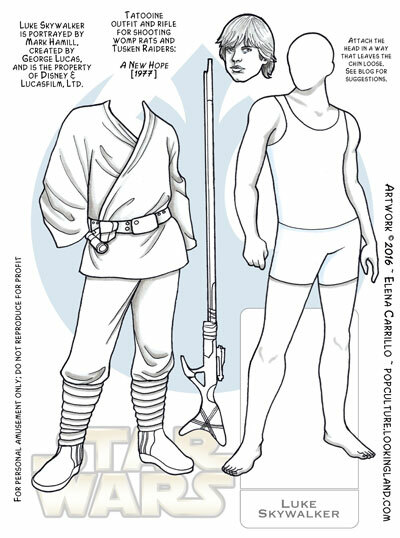 But I promised myself I wouldn’t get all bent out of shape about imperfections, so there you have it: in paper doll land, Luke and Han are about the same height. I’m not 100% happy with how the stormtrooper helmet came out (for Luke or Han for that matter), but I decided to quit fussing with them after a while. 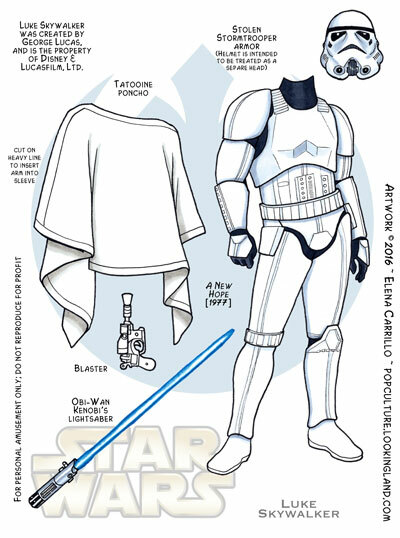 The original stormtrooper helmet design is actually rather difficult to reproduce. I like the new design better, frankly: it’s got cleaner lines and a less convoluted shape. I realize I have way more plates than there are W-Fs in the month of February, but I haven’t decided what to do about that. I will barely have gotten through most of Luke and Leia (and all of Han). I’ve also gotten lazy about finishing the other characters in the series (eek!). I’m having particular trouble finishing Darth Vader at the moment. Seems like he should be easy, but he’s presented some interesting challenges. Might have to make Star Wars an ongoing thing once a week through March as well, I guess. That’s not a bad thing anyway. Welcome to Force February! 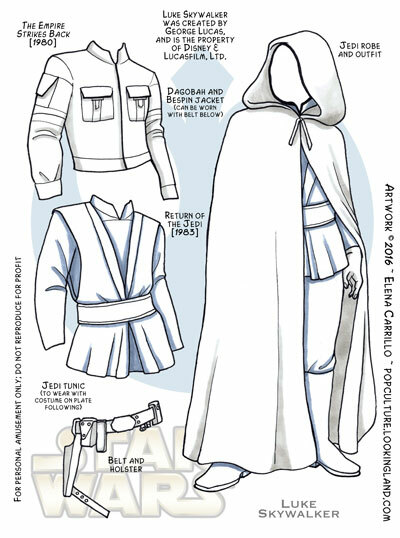 All throughout the month I’ll be posting paper dolls and costumes inspired the Original Star Wars Trilogy (and eventually from the first sequel trilogy film, The Force Awakens. I tend to think about Star Wars as an ensemble saga, but at the heart of it will always be Luke Skywalker whose journey from Tatooine farmboy to Jedi Knight enthralled my generation starting with A New Hope in 1977. 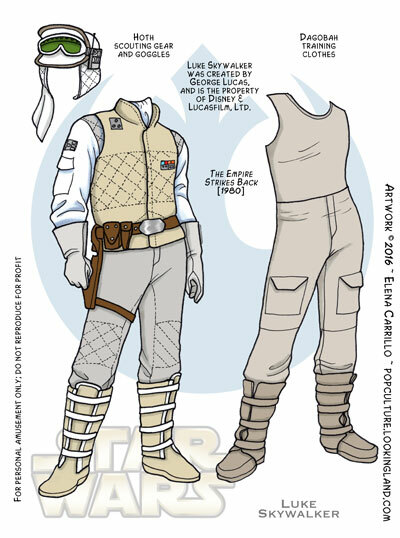 So we’ll kick off Force February with Luke in his iconic Tatooine desert costume. I included his long rifle (though I think it’s a bit short). The design in the background is the symbol of the Rebel Alliance. In the war of “who’s your favorite character in Star Wars?” Luke never won a battle in my book, but not because he isn’t amazing. I just always had a terrible crush on his father ~ ha! I can certainly say I appreciate Luke more now than I ever did when I was a kid because I can see all the things I learned from him throughout the Original Trilogy. And I recognize more than ever that even as a kid I always wanted to strongly identify with his empathy and unswervable moral goodness. Perhaps the fact that I loved his father is a strong indication that I actually identified more with Luke, subconsciously. And Mark Hamill is just an awesome guy (check out his Twitter @HamillHimself). He embraces the fandom with humor, humility, and generosity. What’s not to love? It’s so nice to see him return to this iconic role after spending the last twenty some-odd years voicing the Joker for WB/DC cartoons and the Arkham video games. That makes him a favorite character for me in multiple genres! I drew Luke first when I began this series and I’m surprised at how many costume changes he ended up with (way more than I expected). I skipped the redundancy of his padded Hoth flight suit since it was so similar to his regular X-Wing costume, but I covered all the other pieces. He has six plates in all and comes with a variety of headgear and weapons. I have not yet updated him for The Force Awakens, so there may be an additional plate eventually when I figure out what to do with the other half of that plate. To see all Star Wars related posts and plates, click the tag or the category at right. Click the Luke Skywalker tag to see all of Luke’s plates (this is the first). The Heads: all of the characters’ heads are separated from their bodies so that they can be switched out. Ideally you want to place a paper backing on them so that they can be slipped on over the doll. It’s important that the costumes can be slipped under the chin as many of them have high necklines. The Process: I really wanted to try different things with this series. I wasn’t nearly as experimental as I hoped, but I did push myself a little to include more accessories than I normally produce for paper dolls. The Colored Plates: this is my first time producing both black & white and color variants. For coloring I opted to go digital because once I’d completed the linework, shading, and scanning I thought digital color would be quick and easy. Not only was I wrong, but I’m not sure I like how it came out. I wanted to try something new, though, so there you have it. I may yet go back and hand-color the original art. The Accuracy: I was generally pretty good about looking up references (of which there are plenty), but I still ended up fudging a bit. If you’re so super-geeky to recognize my flubs, you get major points ~ ha!